SEYM Publications offers over 50 titles for sale in print and 4 in ebook formats. 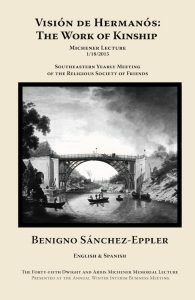 All print publications are available from the SEYM Office: office@seym.org, and for sale at our Yearly Meeting and Interim Business Meeting gatherings. We offer discounts for quantity orders: 10% off for 10 or more; 20% off for 20 or more; 40% for bookstores, including Yearly Meeting bookstores. SALE! 4 for $ 4 + shipping. For SEYM members and attenders, pamphlets 2013 and older are being offered at this sale price. See ‘Walton & Michener Lecture Pamphlets’ below. Susan Waltz shares her spiritual journey and experiences of working in the international human rights movement for 40 years—most notably in volunteer service to Amnesty International. In relating stories of her friendships with North African people, she shows how we can discover our common humanity and create community. She explores the spiritual ground of human equality and commitment to care for the stranger, which “impels us to act with compassion and empathy for those who in many ways (or even, most ways) we recognize as ‘unlike’ us.” Susan also talks about Human Rights as a Collective Good, the UN Declaration of Human Rights, and our responsibility to stand up for the rights of others and respond to the plight of refugees and immigrants. 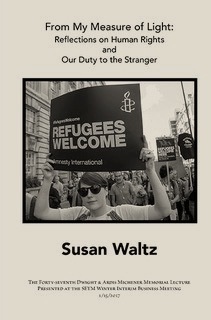 • Dr. Susan Waltz is Professor at the Ford School of Public Policy at the University of Michigan. She has 40 years experience in the field of Human Rights, including serving as chair of Amnesty International’s governing board, and serving on the national board of AFSC. 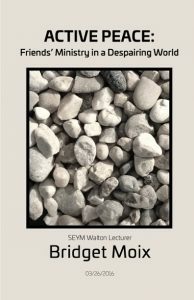 Bridget offers six ‘stones’ to empower us to live and practice a spiritually grounded, pragmatic, and prophetic ministry of peace. • Bridget Moix has worked for AFSC, FCNL, QUNO, Casa de los Amigos, and other organizations. She currently teaches Quaker Social Witness at Haverford and works with Peace Direct. What calls us to act in the world with love? How is our witness as Friends evidenced in our political lives? Diane Randall, Executive Secretary of FCNL, speaks about Friends’ witness and lobbying for peace, justice, and sustainability. Friends’ testimony of Community pulls together the range of Quaker values, and informs all we do together. Creating deeper Community requires preparation and willingness to be transformed. 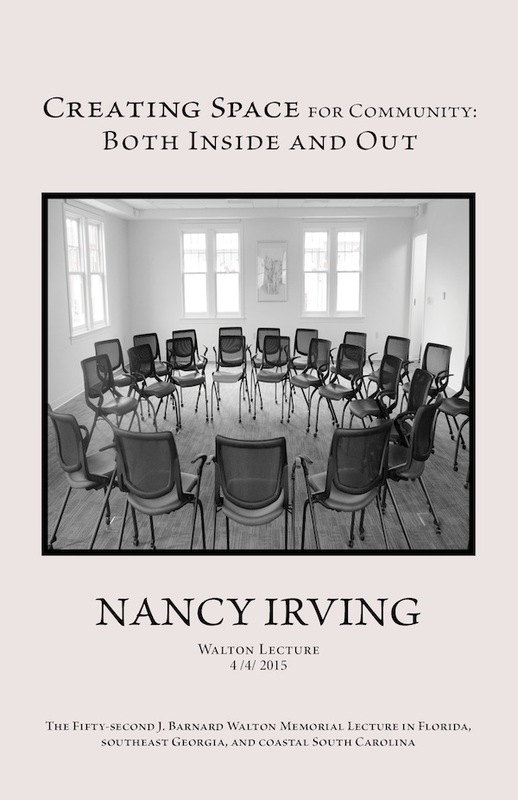 • Nancy Irving has long experience working with groups, including serving with FWCC, both in the Section of the Americas and as General Secretary of the FWCC World Office. Vision de Hermanos: The Work of Kinship • Benigno Sanchez-Eppler. 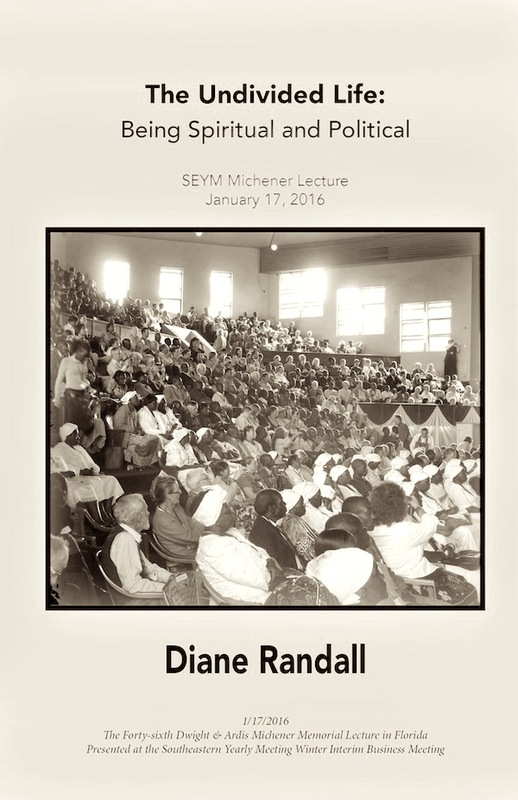 the 2015 Michener Lecture, In English and Spanish. Benigno speaks about “recovering our Quaker economic traditions, and our mix of industry and integrity, simplicity and abundance, and how that history may bring new visions and new opportunities” for Quakers in South and North America. • Benigno Sanchez-Eppler has a rich experience of service, ministry, and sojourning with Friends in New England YM, Cuba, Peru, Bolivia, and the US Pacific Northwest, most recently serving as translator for FWCC and Co-Clerk of the Quaker Youth Pilgrimage. 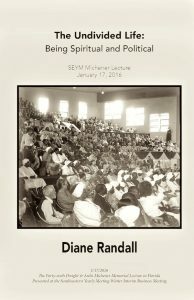 Deborah Fisch spoke out of the silence for this 2014 Michener Lecture, telling us stories about getting to know each other on a deeper level and nourish community. She encourages us to take opportunities to be present with each other, to share our stories and listen to each other, to be faithful in ministry, and to be present together in seeking and following leadings of the Spirit. Deborah Fisch is a member of Paullina Meeting in Iowa, affiliated with Iowa Yearly Meeting Conservative. She is sojourning at Des Moines Valley Friends Meeting. She served for over 17 years as Associate Secretary of Ministries for Friends General Conference and as coordinator of the FGC Traveling Ministry Program. Deaborah also served as presiding clerk of Iowa Yearly Meeting Conservative for 12 years, and as assistant clerk for the eight years prior. She has led many retreats and workshops and consulted with dozens of yearly and monthly meetings throughout the years. $6.00 Proceeds benefit the Youth Program. $6.00 Proceeds benefit the General Fund. Marriage & Commitment, Separation & Divorce. SEYM, 2006. 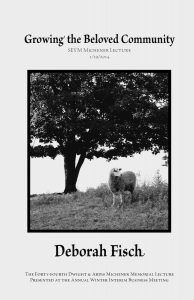 FGC Quakerbooks carries books, pamphlets, ebooks, CDs, and other materials. Pendle Hill Publications carries books and their pamphlet series, which they have been publishing since 1934. 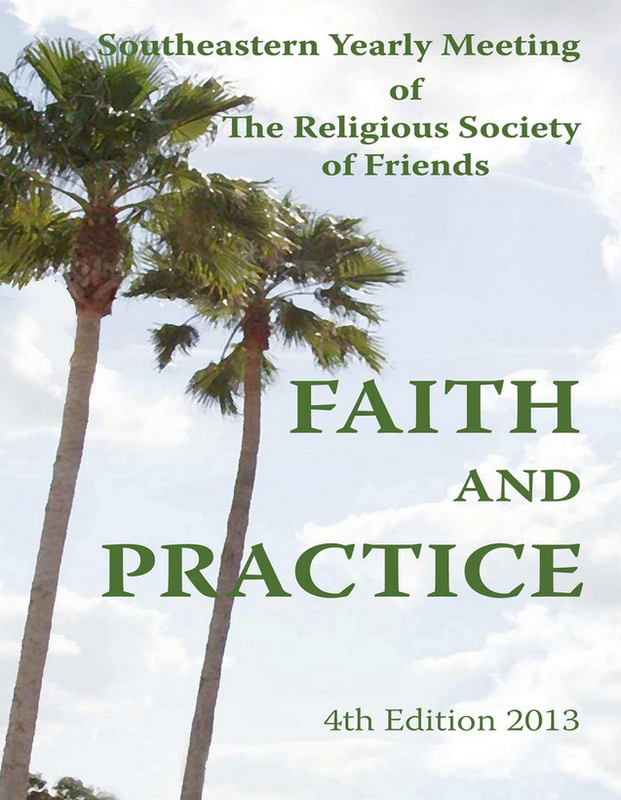 This edition of the SEYM Faith & Practice is meant to be a straight-forward teaching document, easy to read and to be used in our meetings and by all Friends. With those uses in mind, it is offered to you at a reduced price of $16. To Order, e-mail the SEYM office at office@seym.org. $16 + shipping. Discounts: 10% for orders over 10, 20% for orders over 20, 40% for bookstores. 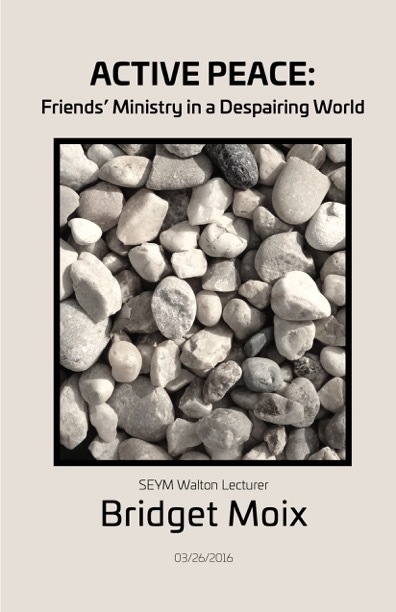 Note: SEYM Publications will resume posting the SEYM Faith & Practice on this website when our costs of producing the book in print and eBook formats have been reasonably recouped. Our Walton & Michener Lectures are a rich resource! Browse by topic and title below. All are $4 + shipping, unless otherwise noted. We offer discounts for orders over 10. To order pamphlets, e-mail your request to the SEYM Office: office@seym.org. Experiencing the Gift of New Life: Stories of My Spiritual Journey, Joe Volk. Joe Volk, Executive Secretary of FCNL for many years, tells stories from his spiritual journey, sharing the lessons he learned from experiences in a living and present Jesus— a teacher who is encountered in the real world and in relationship with others. “I learned that I can’t know Jesus apart from real people in real situations…” 2000 Walton Lecture. How Do I Know It’s A Leading? Ruth Hyde Paine. Ruth shares stories of being led her personal life, and what her experiences have taught her about leadings: asking for them, hearing them, waiting, doubts and discernment. “How do I know it’s a Leading? For me, it’s often very hard to tell.” Ruth was a member of St. Petersburg Meeting for many years, devoting much of herself to ProNica. 1992 Michener Lecture, reprinted 2002. Change and Preservation in the Same Current Lloyd Lee Wilson. Wilson talks about our collective experience of ‘Continuing Revelation:’ through the ongoing Divine guidance, “we may see what God is showing us ever more clearly…. So there is room for growth and development”— because as we mature, individually and collectively, our understanding deepens. He explores how our understandings of membership and meeting for business are undergoing transformation. “…the present guidance of the Holy Spirit is again pointing toward change which is renewing and at the same time is in unity with our past faith and practice. The task before us is to listen ever more carefully to what the Holy Spirit has to say to us today…” 2011 Michener Lecture. Deeply Rooted: Alive in the Spirit Marcelle Martin. Marcelle shares experiences that transformed her understanding of who we are and what we are called to be and do. “Friends are called to play a significant role in a global transformation of consciousness. We are called to live and love in ways that help bring divine healing to this world. To do so, we must become deeply rooted in that Mystery we speak of variously as God, Spirit, the Light, the living Christ, Love, the Good.” 2009 Michener Lecture. Leadership and Authority in the Religious Society of Friends, Arthur Larrabee. Having rejected the ‘Power Model’ of leadership, along with human leadership, Quakers can sometimes end up with dysfunctional forms of authority. Larrabee describes a positive, ‘Quaker Model’ of authority where human leaders act under spiritual guidance, working with others, in service of the community. 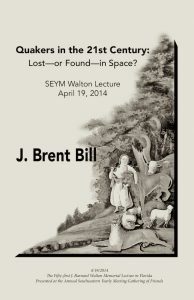 The 2007 Walton Lecture. Finding Our Sacred Ground: Quakerism’s Place in a Globalized Future, Daniel A. Seeger. The 2001 Michener Lecture. The Quaker Meeting for Business, Douglas Steere. Steere offers a concise introduction to the Quaker meeting for business, and provides examples of the power of Silence, participative humility and reaching unity. He also describes some ‘occupational diseases’ that can arise as we practice this radical form of decision-making. 1982 Walton Lecture, reprinted 2005. The Quaker Meeting for Business, Douglas Steere. Steere offers this simple introduction to the Quaker meeting for business, and provides examples of the power of Silence, participative humility and reaching unity. He also describes some ‘occupational diseases’ that can arise as we practice this radical form of decision-making. 1982 Walton Lecture, reprinted 2005. Equality Deborah Ann Saunders. Speaking out of the silence, Deborah shares personal stories of personal transformation: of being led by the Spirit to reach out love in very difficult situations, making brothers and sisters of the stranger and the difficult person, and overcoming the divide of racism. She also strongly inspires and challenges us Quakers to get out of our comfort zone, feel the revolution that Spirit calls us to, and do what we really need to do about social justice, peace, and racism. The 1999 Walton Lecture. Friends Leading: Climate Change: A Crisis of Spirit, Roy Taylor III. Roy talks about how our testimonies, practices, and organizations equip and call Quakers to be leaders in earthcare. He challenges Friends to be active and lead in addressing Climate Change. He shares his stories of working with others to create sustainable living solutions. 2013 Walton Lecture ($6 + shipping).